Here's how to recharge it and what to do if that doesn't work. You drove home last night and everything was fine with your vehicle, but this morning, you have a dead battery. You need to get your car going again–of course. But how? You could finagle a jump-start from a neighbor, friend, or relative. Maybe your car will keep running fine after that, but maybe not. How about recharging your battery? A great idea, but one that's not so easily accomplished. And will it work? Is the battery completely shot, or will a recharge boost it back to life and get you on the road again? We'll show you how to recharge it in five easy steps in the accompanying videos, but that still might not solve your problem. The best thing you can do when your battery goes flat suddenly is to figure out why and what shape it's actually in. Did you leave the headlights on last night? Or an interior light? Either of those could be enough to run the battery down. Attempting a recharge will also help you know if you need a new battery. How so? If the battery takes the charge and you can restart your vehicle, it might not be totally dead. But if it then dies a couple of days later, it could be either a failing battery or the fault of something else in your car's electrical system–starting with the alternator, which supplies electricity to run the car and charge the battery. If the battery won't even take a charge, it's almost definitely dead and needs to be replaced. If you're intent on recharging your battery, you're going to need a battery charger. There are many good ones on the market. Better still, if a friend or relative has one that you can borrow, you're in luck. In the following videos, we use an Optima charger that we have had good experience with in the Car and Driver garage. Most auto-parts stores carry chargers and they're readily available through online retailers such as Amazon. First, find your vehicle's battery and locate the positive and negative terminals. Most cars have their battery under the hood. The positive terminal is marked with a "+," and the negative terminal is marked with a "-." Sometimes the terminals are protected by plastic covers that need to be flipped out of the way, so you can charge the battery. Next, make sure your battery charger is unplugged from the wall socket–it uses household current to charge the battery–and that it's switched off, just to be doubly sure there's no current flowing through it. Read the instructions that come with the battery charger, as each charger operates a little differently. Attach the charger's red clamp to the battery's positive terminal and the black clamp to the negative terminal. Give the clamps a little wiggle to ensure that they have a good connection to the terminals. For the greatest safety, keep the charger as far away from the battery as the cables allow. Now plug the charger in and turn it on. The Optima charger that we're using here has a switch that sets it for either a motorcycle or car battery or one of Optima's high-performance batteries. 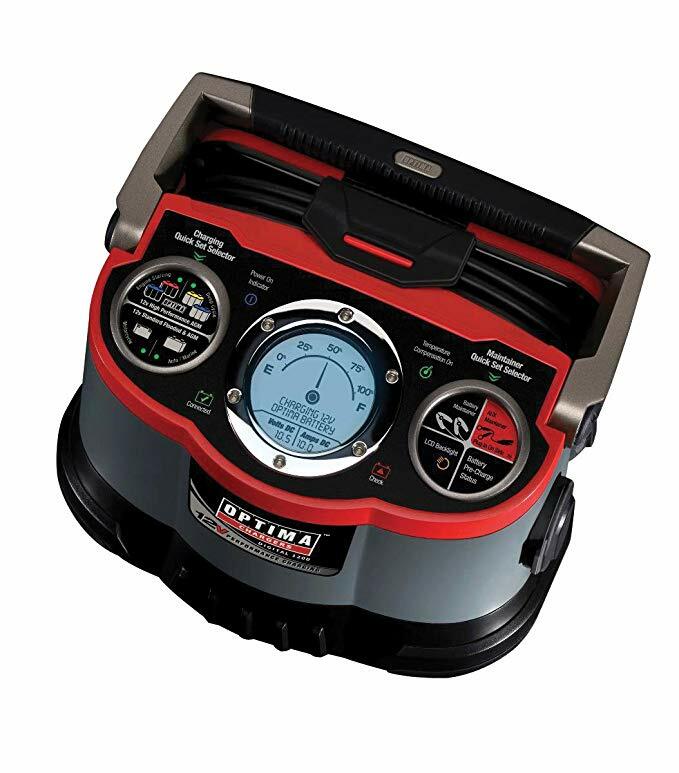 The Optima charger will automatically shut off when the battery is fully recharged. Other chargers work differently; they may not shut off automatically but rather have gauges that let you know when the battery is charged. Many battery chargers deliver two to six amps (some allow you to choose the amperage level) and will take at least several hours to recharge a dead car battery. Read the instructions that come with the charger to be sure you're operating it correctly. When the battery is fully charged, shut off the charger and unplug it. Then remove the cables, unhooking the negative (black) clamp first. Remember, unless you know the reason your battery died (say, because you left the headlights on overnight) even though your vehicle starts and runs after you recharge the battery, something in your electrical system may be causing the problem. Expect your battery to run down again (and be happy if it doesn't). If your battery soon weakens or gives out, consider removing it and hauling it down to an auto-parts store. Many will test the battery for you, and you can pick up a new one while you're there. Alternatively, jump-start your vehicle and get it down to a repair shop. You either have a bad battery or an electrical-system issue; you'll need the help of a technician to solve the problem. Anyone wanting to buy a Exide Automotive Battery from Amazon for $533.14? WTH! Dash Cam draining battery OR do I have a bad battery?